Which Do You Need - A Cage or Enclosure? Backflow preventer enclosures come in a variety of materials all with various levels of protection. For backflow prevention devices 3" and smaller, it's very common to see backflow cages. These cages are typically made of expanded metal and are relatively inexpensive to produce in small sizes. This is what has led to their popularity for irrigation/sprinkler backflow preventer protection. Cages are designed to protect devices from theft and vandalism. Backflow valves are made of copper, brass, or galvanized steel pipe. These are valuable metals and when the recession of 2008 began, backflow preventer theft increased dramatically. If you need to protect your equipment, you'll need to decide which you need - a cage or enclosure. Here are a couple common scenarios to help you in this decision. If you live in one of the states where the temperature rarely falls below 32°, choosing a cage for backflow theft protection may work out for you. Since there is no need for freeze protection (usually), then a cage is a pretty safe bet. You may save a little money choosing a cage over an enclosure made of aluminum or fiberglass. They are typically available in green, and therefore can be disguised by landscaping rather easily. The main risk you take in this situation, surprisingly, is theft. Anyone can see the valuable metal inside the backflow cage, and they are often secured with a cheap lock. Better protection exists in full enclosures, but the risk is relatively small these days. Back in 2008, backflow valves were more tempting to thieves, and hiding them was important. For now, you should be safe with a cage. You may be surprised to learn that cages are very popular throughout Colorado and the surrounding areas. Larger backflow preventers are typically installed in vaults or inside, but irrigation and a few domestics end up outdoors. Even though much of Colorado has more than 100 days per year where the temperature is around or below freezing, cages are still a viable option for irrigation backflow preventers. They just need to be "winterized" each year. This involves one of two options. Either the community or building utilizing the irrigation valves will turn off the line and physically remove the valve, or they will insulate it with another product. Using backflow cages in colder climates like Colorado is doable but does take a little extra planning and work. If you were to choose an insulated or heated enclosure instead, you'd have protected valves year round without any extra thought or work needed. 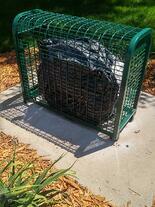 The reason backflow preventer cages work better in Colorado than they do in Florida is future planning. In Colorado, everyone knows it's going to freeze, and they do their best to prepare for it. This includes backflow preventers in cages. However, in Florida, freezing happens unexpectedly, and you're not going to be cutting the water lines and "winterizing" them each year. It doesn't help that all sizes and types of backflow preventers are most commonly outside and above ground in Florida. You can lose count of them just driving down a commercial street. If the area were to freeze, like has happened before in Florida in 2010 and 2012, these may be damaged and need to be replaced. That would put the building without water and the building owner in a frustrating situation. Do a quick online search and you'll see how often areas that aren't expected to freeze actually do. In these areas, keep that equipment in an enclosure. Pay once for the valves and their protection because if something does happen that could damage it, it will be unexpected. HOW CAN YOU KNOW WHETHER A CAGE WILL BE ENOUGH? You just can't. Choosing between a backflow cage or enclosure requires you to weigh the possible risks and decide for yourself. Here are the facts. There are many companies that make cages for backflow preventers and other equipment. They come in a variety of sizes, and you do have the option of ordering a custom size. 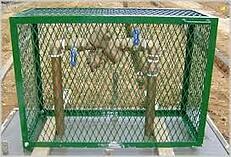 Backflow cages have no insulation at all to provide frost or freeze protection, but do provide some vandal, accident and thief protection as they are powder coated steel and do include a locking mechanism. Cages used to be a less expensive alternative, but are now about the same price as an aluminum enclosure. They are useful in warm environments that do not have below freezing temperatures, but there is always a chance that the weather will do something unexpected as outlined above. If you can plan for bad weather and winterize, and backflow cages are significantly less expensive than enclosures in your area, then a cage is probably for you. Weigh your options because it's up to you to choose the level of protection your equipment needs.